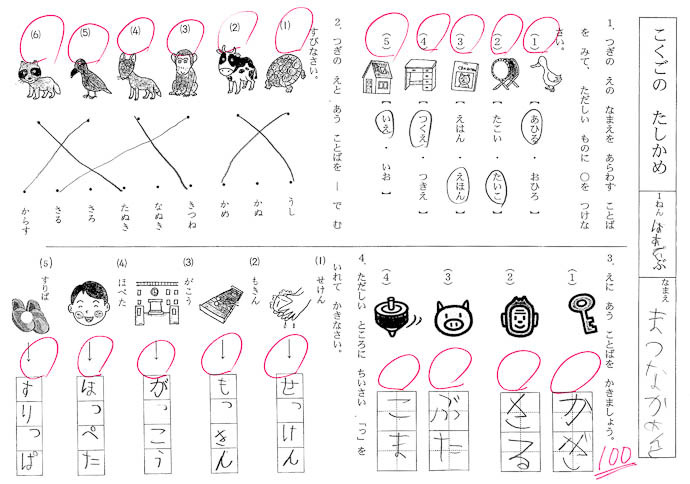 It seems that Anthony had his first “test” in school, in Japanese class, and he came through with flying colors. I don't think I would have realized that the (2) in the lower-right was a monkey, so I would have missed some points. As a 45 yr old who is just now starting to learn Japanese, I’m amazed at his ability and great penmanship with the hiragana. Post as many of these sheets you want Jeffrey! I will use them to test myself as well! It was neat seeing that test. It’s great to be able to master two very different languages like he will. Definitely a gift. I know two languages pretty well but those are two western languages, not very different in the end. Yet I feel lucky. If all goes well for us my kids will probably have to learn three languages. What a world! It’s about time we fully open our frontiers and let people be citizen of the world and not just a country. Wow, such a cute test paper. Good job Anthony! Keep it up. I am amazed at how kids can identify things and connect the dots. My 6 yr old amazes me all the time too. (2) looks like a Cyberman from Doctor Who.